The value of preferential access schemes by the main purveyors of preferences, the EU and the US, has eroded over the years – there has been a lowering of most-favoured nation (MFN) tariffs, an extension of preferences by the EU and the US to more countries, and unpredictability that is often compounded by the complicated origin requirements to qualify for preferential access. Conconi et al. (2016) estimate that in the case of NAFTA, rules of origin (RoO) on final goods reduced imports of intermediates from third-countries by about 30 percentage points. They conclude that even if external tariffs are unchanged, RoO embedded in FTAs may violate multilateral trade rules by substantially increasing the level of protection faced by non-members. Against this trend, four changes in origin requirements have sought to restore market access. In 2001, under the Africa Growth Opportunity Act (AGOA), the US announced that certain beneficiaries would satisfy the origin requirement for apparel under the ‘single transformation’ rule (textiles→apparel) while the EU maintained a ‘double transformation’ rule (yarn→textiles→apparel) requirement for apparel under the Everything but Arms (EBA) initiative (see Figure 1a). Second, the EU adopted the single transformation rule for EBA (i.e. least developed countries) beneficiaries in 2011 (see Figure 1b). 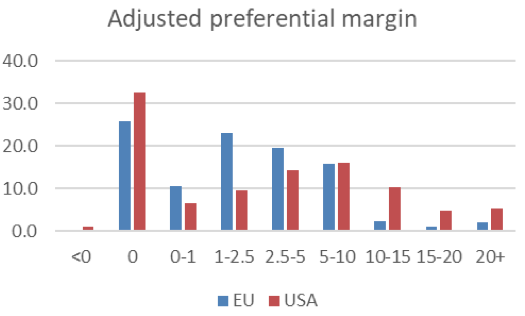 For both the EU and the US, the (unadjusted) preferential margins for exports of apparel were quite similar – 15% for the US and 11% for the EU. 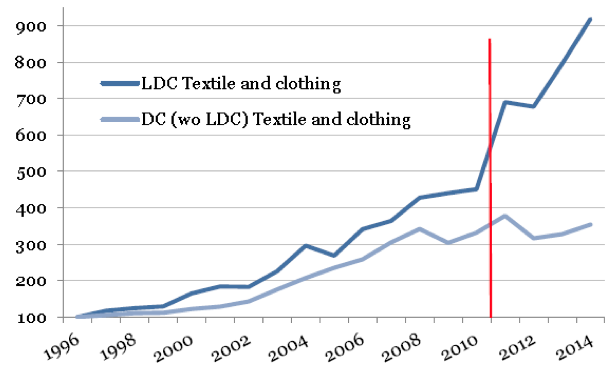 Both figures show that an increase in apparel exports followed the move to a single transformation rule. Third, at the WTO ministerial in Nairobi in 2015, for non-reciprocal preferences for least developed countries, WTO members have committed to allow that non-originating materials can make up to 75% of the final value of a product to qualify for preferential treatment. Fourth, to alleviate the refugee crisis in Jordan, an EU decision (Decision No.1/2016) provides relaxed origin requirements for a list of goods produced in Jordan for a ten-year period until 31 December 2026. The hope is that this relaxed requirement will create up to 200,000 jobs for Syrian refugees. The list of goods includes petroleum products, fertilisers, some chemical and plastic products, articles of leather, textiles, and apparel. Notably, manufacture from fabric is sufficient to confer origin to Jordanian apparel. This amounts to a temporary replacement of the double transformation rule by a single transformation rule for apparel. Note: Solid line indicates entry into effect of AGOA and dashed line indicates entry into effect of single rule (for most beneficiaries). Source: Melo and Portugal-Perez (2014, Figure 1a). Note: Base: 1996=100. Vertical line indicates entry into effect of single transformation rule. In Brunelin et al. (2018), we assess this initiative by comparing Jordan’s current utilisation of EU-preferences under the EU-Jordan FTA (EUJFTA) with the utilisation of preferences by Jordanian exports to the US under the Jordan-US Free Trade Area (JUSFTA) – both FTAs that came into effect over a ten-year period starting in the early 2000s. We conclude that the relaxation decision could help alleviate the refugee crisis in Jordan. From a broader perspective, simplification of RoO requirements may be the easiest way to restore preferential market access, especially for the EU and the US, who have extended preferences to many trading partners. Adjusted preferential margins (sometimes called ‘competition-adjusted margins’) provide a first rough measure of potential market access because they exclude from preferences the trade-weighted preferences extended to other partners. This adjustment is important for the EU and the US, both purveyors of preferences to many trading partners. 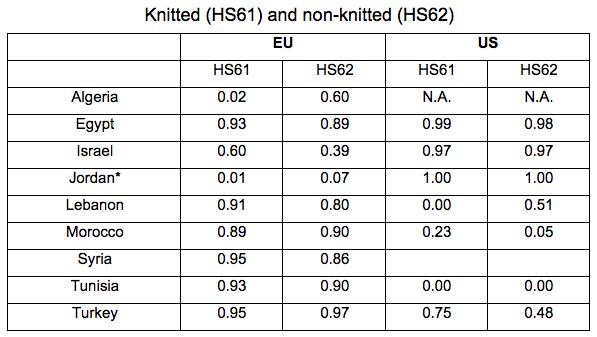 The distribution of these adjusted margins – which apply to all partners engaged in FTAs with the EU and the US – are shown in Figure 2 at the most disaggregated (HS8) product level (the difference between unadjusted and adjusted margins for apparel are reported in Table 1). Figure 2 shows a similar distribution of preferences for both countries. Between 25% and 30% of Jordanian exports to the EU and the US have no preferential margin, a reflection of zero MFN tariffs. Both the EU and the US only have 15% of their preferential margins for Jordanian imports in the 5–10% range. The EU has a lower share of tariff lines with preferential margins in the 10–15% range and beyond (around 2%–3% versus 5% for the US). All in all, both the EU and the US still have non-negligible access to offer to Jordan. the size of the shipment, because of the fixed costs of complying with the RoO requirements. For apparel, different RoO requirements are the most important difference between the two FTAs. In the case of JUSFTA, the single transformation rule applies, whereas for most other US FTAs a ‘triple transformation rule’ (cotton→yarn→textiles→apparel) applies. Under EUJFTA—until the decision of August 2016 – Jordan’s requirement for access to the EU required a double transformation rule. The disparity in PURs and import volumes is noteworthy as the markets for imports of apparel are of comparable size for the EU and the US and involve many common exporters of apparel. Imports of apparel under EUJFTA are negligible, while they are from 100 to 300 times larger under JUSFTA. This pattern does not extend to other products at the HS8 level. Outside the apparel sector, comparing PURs at the product (HS8) level for EUJFTA and JUSFTA show similar patterns where, as expected, PURs are higher for products with higher adjusted preferential margins. For given preference margins, higher PURs are observed for products with larger traded volumes, an indication of the fixed costs associated with satisfying origin requirements (Cheraskin et al. 2011, Keck and Lendle 2012). Notes: (a Adjusted margins (for preferences granted to other partners) in brackets. (b) See text for definition. To further illustrate the role of RoO requirements, Table 2 reports the sharp differences in PURs for apparel imports across a selection of exporters engaged in preferential trade arrangements (mostly reciprocal) with the EU and the US. These PURs differ widely across partners, especially for the US. This disparity in PURs probably reflects Donner Abreu’s observation that no two RoO requirements for textiles and apparel are the same across the eleven preferential arrangements tallied (Donner Abreu 2013, Table 5.2). Source: Brunelin et al. (2018). As a further check for the presence of a Jordan and/or apparel effect, using data for 2016, we regressed PURs on preference margins and import volumes at the HS8 level for all countries exporting under preferential schemes to the EU and US. Statistically significant estimates show that PURs are positively associated with preferential margins and, controlling for preferential margins, a higher average import volume is associated with a higher PUR, an indication of the presence of fixed costs. The interaction of a dummy variable for Jordan with a dummy variable for T&A is positive for the US and negative for the EU, a reflection of the fact that the US only grants the single transformation rule in apparel for Jordan (and qualifying AGOA exporters) while other partners receiving US preferences have to meet the triple transformation rule. On the other hand, the negative coefficient for the EU dummy interacted with the T&A dummy captures the effects of the single transformation rule granted by the EU under EBA. Together, these results point towards the origin requirement in T&A having an independent effect on PURs for those products. The EU relaxation decision aims to create 200,000 job opportunities for Syrian refugees. This is an ambitious target. First, since beneficiaries must be located in designated special economic zones, this could be equivalent to a quota on exports under a capacity constraint eligible for preferential market access. Second, companies operating outside the designated areas will have to incur costs to move operations if they want to benefit from preferences, and the conflict in Syria has left the port of Aqaba in the south as the only viable option for Jordanian exports. Third, least developed countries have access to the EU market under the single transformation rule since 2011. Looking ahead, further simplifications in origin requirements would help restore market access. For apparel, a uniform low value content rule (say, 10% value-added across the board), perhaps combined with a change of tariff classification at the subheading (HS6) level, could be envisaged. In any case, for all products, eliminating RoO requirements for tariff lines with unadjusted preferential margins below 3% – which corresponds to the middle range of estimates of fixed costs for meeting origin requirements – should help, especially the small exporting firms. And progress at multilateralising reciprocal RoO would also be most welcome. Editors Note: A version of this column, taking a broader perspective on Jordanian export performance under EUJFTA and JUSFTA, appeared on the ERD forum. Brunelin, S, J de Melo and A Portugal-Perez (2018), “Improving market access for developing countries: A case study of Jordan’s exports to the EU”, CEPR Discussion Paper 12743 (forthcoming World Trade Review). Cadot, O and J de Melo (2007), “Why OECD countries should reform their rules of origin”, World Bank Research Observer, 77-105. Carpenter, T and A Lendle (2011), “How preferential is world trade”, VoxEU.org, 25 March. Cheraskin, I, S Demidova, H Looi Kee and K Krishna (2011), “Trade preferences as catalytic aid”, VoxEU.org, 19 February. Conconi, P, M Garcia Santana, L Puccio and R Venturini (2016), “The perverse effects of rules of origin”, VoxEU.org, 16 March. Donner Abreu, M (2013), “Preferential rules of origin in regional trade agreements”, WTO, ERSD-2014-05. Keck, A and A Lendle (2012), “New evidence on preference utilization”, WTO, ERSD-2012-12. de Melo, J and A Portugal-Perez (2014) “Rules of origin, preferences and diversification in apparel: African exports of apparel to the US and the EU”, World Bank Economic Review 28(1): 78–94. Excluding intra-European trade, the WTO (2011) estimates that, for the 20 largest importers accounting for 90% of world trade, only 16% of their imports from partners qualify as preferential trade (on the assumption that all preferences are fully utilised).